Ed Gillespie, the Republican candidate who lost the 2017 Virginia governor’s race to Ralph Northam, said Virginia has much healing to do. “For Virginians, this is a very painful time to see these images splashed up on television screens and newspapers, and it doesn’t reflect the Virginia that I know and fellow Virginians know,” Gillespie said Thursday while attending the second annual Jay A. Parker Lecture and Reception at The Heritage Foundation. After Northam’s medical school yearbook surfaced from 1984, showing someone in blackface standing next to someone in a Ku Klux Klan outfit on Northam’s page in the yearbook, the governor denied he was either person, after initially apologizing. However, Northam, a Democrat, admitted to once dressing up in blackface to imitate Michael Jackson in 1984. This came days after he seemed to advocate infanticide of newborn babies in certain circumstances. During the gubernatorial campaign, a liberal group ran a racially charged political ad against Gillespie, tying him to neo-Nazis. The revelation of Northam’s past blackface resulted in bipartisan calls for the Democrat to resign, including from Kay Coles James, president of The Heritage Foundation. Gillespie—in the audience for the Heritage event—didn’t address whether Northam should resign, but did reference Virginia’s past with slavery and segregation. Gillespie noted much of the civil rights movement occurred in Virginia, but also said most plaintiffs in the landmark Brown v. Board of Education case that led to desegregation of schools were also from Virginia. There was disagreement among panelists and audience members about Northam’s future—but in the spirit of the forum on civility—the disagreements were agreeable. 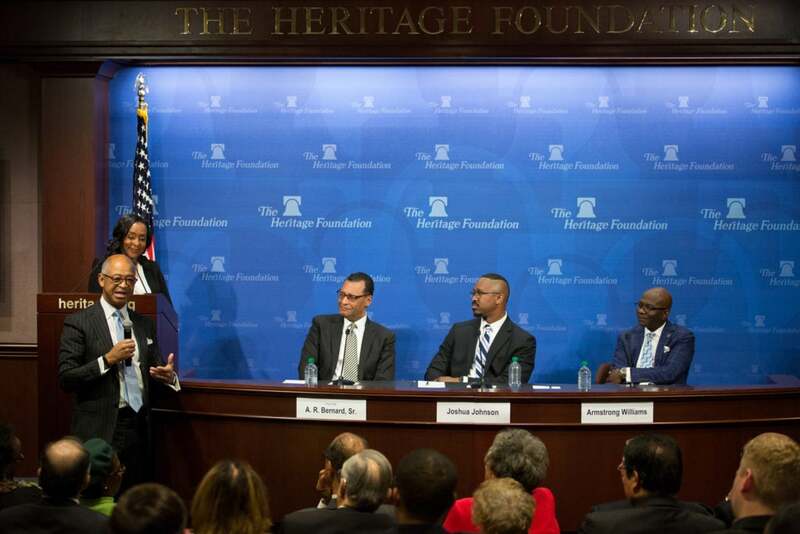 The panel included conservative broadcaster Armstrong Williams, Pastor A. R. Bernard Sr., National Public Radio’s Joshua Johnson, and Heritage’s James. “The current governor of Virginia, his biggest crime is he’s a hypocrite,” Williams said, referring to the Latino Victory Fund commercial that showed a truck with an Ed Gillespie bumper sticker attempting to run down minority children. Still, Williams said Northam shouldn’t be driven from office. Heritage’s James expressed warmth for Williams, but gave a counter view. “One of the things that was so hurtful for us who loved Ed Gillespie, who knew him as a person, was to see how he was characterized during that whole process. That was painful,” James said. For me, that was just one small part of it because the whole thing on infanticide was right up there and looms big. So—I would have said to a conservative as well—there are consequences that really attack your ability for moral leadership, and maybe you should just go sit down for a minute and let things heal. It may be time for Northam to resign, said Bernard, founding pastor of the Christian Cultural Center in New York City as well as founder of the Brooklyn Preparatory School and Cultural Arts Academy Charter School. “Adam and Eve were forgiven, but they were put out of the garden,” Bernard said, in referring to forgiving Northam. During the discussion, Robert Bluey, editor-in-chief of The Daily Signal, spoke briefly about his recent interview in New York with Hawk Newsome, a Black Lives Matter leader. Bernard responded that this is an example of reaching beyond an immediate circle. There are blacks who can’t see white poverty because of white privilege. There are whites who can’t see white privilege because of their own poverty. We have impasses like that that blind us to the reality that we are both in the same boat. If we could start having conversations and get beyond the noise, we could really start moving in a positive direction. Williams said the rush by the media to believe Jussie Smollett, the “Empire” TV star charged by Chicago police Thursday with faking a hate crime against himself, was indicative of the polarization. Blacks felt they saw oppression. Gays felt they saw homophobic slurs. Certain communities felt that even in the dead of winter they can be targeted. And also, they saw this: No matter how high a black man may rise, he’s still reminded he’s still a black man. All those things came to bear. So they wanted it to happen. What they don’t understand is the only thing we know about Smollett is from ‘Empire,’ is from the media, is from hearsay. We really don’t know who he is. A theme throughout the discussion was that a symptom of polarization is that many Americans get their news only from outlets that reinforce their pre-existing notions. Michael Steele, like Gillespie, a former Republican National Committee chairman, said leadership has two elements. The first is leading, but the second can be more important. The lecture was named for Jay A. Parker, who led the Lincoln Institute for Research and Education and was editor of The Lincoln Review. The Heritage Foundation described Parker, who died in 2015, as the “founding father of the emerging black conservative movement.” He was an active member of the American African Affairs Association and worked to spread freedom and democracy in newly independent African nations.